Blood Lad was one of the several anime this summer that didn't make my list of the five anime you should be watching. That doesn't mean it is bad, however. Rather, Blood Lad is a fun, light-hearted comedy adventure that could teach your average fighting anime a thing or two. Staz is a vampire who suffers from an affliction common to those with wealth and power (at least in anime): apathy and boredom. While he is at the top of the food chain and has carved out his own territory, he longs for something he can't easily obtain—namely all things game- and anime-related from the human world. And when average human girl Fuyumi stumbles into the demon world and is killed, he decides to resurrect her and add her to his collection. Over the course of their adventure, they encounter tons of colorful characters—from vampires and werewolves to teleporters and shapeshifters. It's always fun to see who the pair will encounter next. Much of the humor in Blood Lad comes from the fact that, like many anime fans outside of Japan, Staz is obsessed with Japanese Otaku culture. Thus he (and to some extent the other characters) continuously reference some of the most famous anime and manga of all time. Sometimes, it's a little thing, like clapping his hands before touching the earth and making the ground erupt or getting shot in such a way that the bullet holes form the pattern of the big dipper across his chest. Other times it's a bit more obvious—like the time he actually starts doing a kamehameha. All these little in-jokes make this show a lot of fun to watch if you're a long-time anime fan. In general the biggest problem with fighting anime (like Bleach, Naruto, or Dragon Ball Z) is one of pacing. Single battles can go on for countless weeks with little to nothing being resolved in each individual episode. Blood Lad, however, does not fall into this pattern. What would be entire arcs of a normal fighting anime instead flow by in a mere two or three episodes. Yet, despite covering a lot of ground in ten short episodes, the series never feels rushed. With great pacing, we're always being introduced to new characters, new places, and new challenges for our heroes. In other words, we are able to focus on the adventure aspect that makes fighting anime so enjoyable without the usual helping of useless filler being forced upon us. [Skip to the next section to avoid spoilers.] 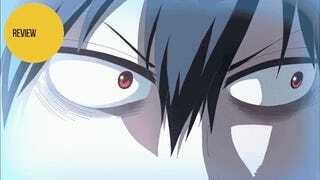 Usually, fighting anime like Blood Lad go out with a giant final battle or similar action climax. However, Blood Lad ends with a character-based climax. Over the course of the series, Staz develops very little. He is completely selfish—even his desire to resurrect Fuyumi is simply because he wants to have a real human for his japanophile collection. However, the climax of the series is about his deciding to make the first true step away from that—to allow Fuyumi to set their path even if it goes against his selfish desires. In the end, it makes for a satisfying conclusion to this series—it really does feel like the "end of the beginning" of their adventures. If I have one complaint about Blood Lad, it's that instead of creating a magical world that captures the imagination, it takes a naturally fantastical world filled with vampires, werewolves, and other monsters and makes it painfully mundane and boring. Simply put, the demon world of Blood Lad is little more than urban Tokyo if it were run by gangs of juvenile delinquents. The fact that said delinquents have mystical powers is largely irrelevant. In large part, the first half of the series remains trapped in this boring environment—making the demon world and the conflicts that take place there the weakest aspect of the show. Luckily, the second half of the show has the cast spending less time in the giant city and more time in more interesting locations like Gothic-inspired flying islands. All in all, while it's not one of the season’s best five anime, Blood Lad is certainly watchable and more than a little enjoyable. If you are a longtime anime fan, you'll no doubt get a real kick out of all the inside jokes the series has to offer. And if you like fighting anime but don't have time to watch hundreds of episodes, Blood Lad may be the perfect way for you to get your fix. Blood Lad aired in Japan on Tokyo MX. In the United States, it is available for free and subtitled in English on Hulu.